Just a quick, speculative rumination. Can we think of the resuscitation of a particular architecture style as a lazarus taxon? The term (borrowed from the field of paleontology) describes an animal that disappears from the fossil record, only to reappear again. There are some well-known examples, such as the coelacanth and the ivory-billed woodpecker. These animals were thought extinct, but were subsequently discovered in their respective habitats. There is plenty of scholarship out there that considers how a lazarus taxon can appear to come back from the dead. Can we apply such an idea, especially when writing and studying architecture history? The example that comes to mind is Reyner Banham's inclusion of Russian constructivism and Italian futurism in his important Theory and Design in the First Machine Age (1960). Prior works, such as Nikolaus Pevsner's Pioneers of Modern Design: From William Morris to Walter Gropius (1936), and Henry Russell Hitchcock's Modern Architecture (also 1936) exclude Russian and Italian experiments in modernism from their own polemical narratives. 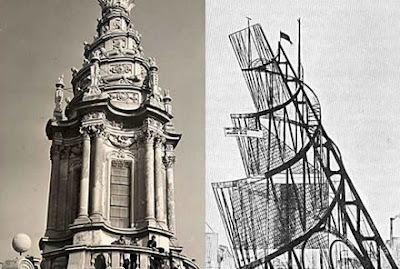 Siegfried Giedion's Space, Time, and Architecture (1941) does mention Tatlin's Monument to the Third International, but placing an image of Tatlin's Tower next to the lantern of Francesco Borromini's Sant'Ivo alla Sapienza suggests an unnatural interregnum. The conjunction of 'the mechanical aesthetic' with 'constructive sensibility' and of a 'new machine aesthetic' with a list of artists is symptomatic, if no more, of a growing feeling, which has much later been codified as a definite credo, that the art proper to a mechanical age is Russian Abstract art, loosely termed Constructivist (1960: 188). For Banham, then, Russian Constructivism is a Lazarus Taxon: a species of architecture that though eradicated from previous historical records, reappears once again.